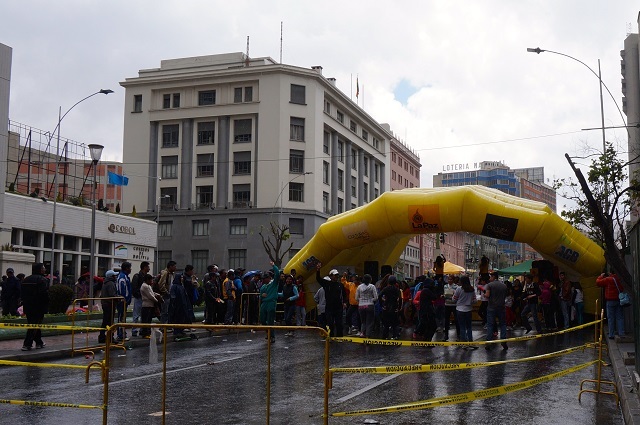 Bolivia’s fourth annual Day of the Pedestrian and Cyclist banned cars from all roads, cutting greenhouse gas emissions and giving pedestrians space for a variety of activities. 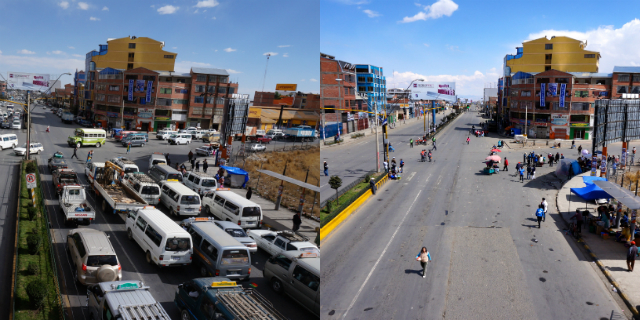 El Alto’s Cruce Viacha, which is full of traffic on a typical weekday (left), is transformed on the Day of the Pedestrian (right). Photos by Gwen Kash. 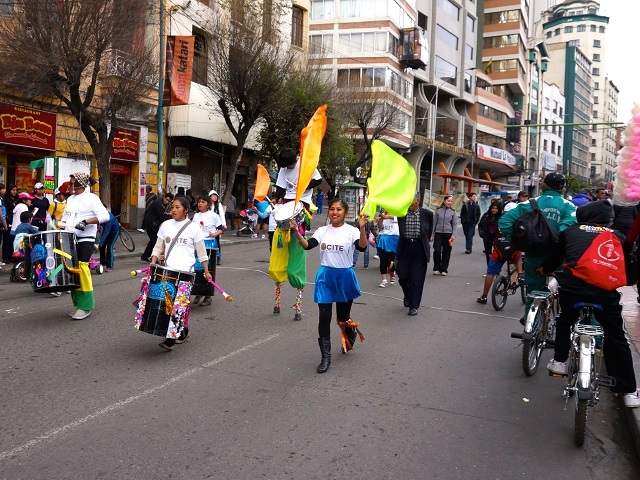 On the first Sunday in September, 2014, cities across Bolivia closed their roads for the fourth annual “Day of the Pedestrian and Cyclist in Defense of Mother Earth.” The event, often referred to simply as the “Day of the Pedestrian,” is an expanded version of the ciclovías held in many cities, where streets are closed to cars and dedicated to cyclists and pedestrians. Instead of closing a limited number of avenues, however, each road in the capital city of La Paz was closed from 9am to 6pm, and each was closed in the neighboring city of El Alto from 8am to 6pm. The event had the dual purpose of reclaiming public streets for pedestrians and cyclists and reducing the consumption of fossil fuels. The municipal government of La Paz reported that this year’s event reduced carbon emissions for the day by 64.8%. On El Prado, La Paz’s main street, the periodic Sunday-morning fair was expanded and focused on physical fitness. Organizers laid down turf for miniature soccer fields and volleyball courts. Aerobics classes were held in several locations. 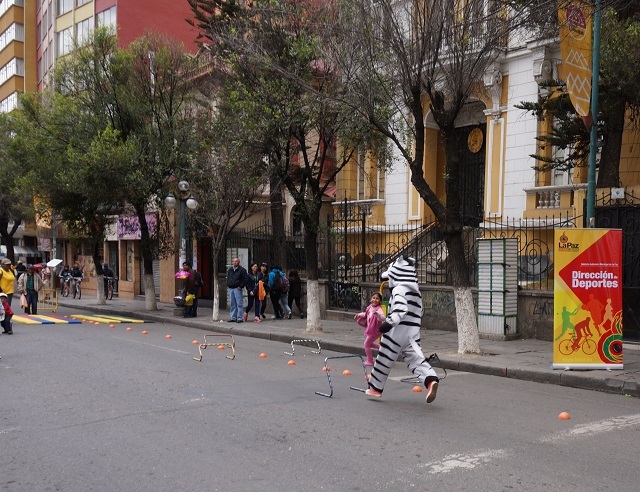 The city’s distinctive zebras – city workers who wear zebra costumes and encourage drivers and pedestrians to obey traffic laws – took a break from their usual job to encourage the children of La Paz to come out and play. One of the city’s zebras races against a young paceña to complete an obstacle course. The zebra lost. Photo by Gwen Kash. While scattered rain showers interrupted some of the fun, many residents were undeterred. An aerobics instructor encouraged the crowd to keep going as rain began to fall, saying “Just like we don’t stop playing soccer when it rains, we don’t stop doing aerobics!” Most participants continued to dance enthusiastically. Photo by Gwen Kash. 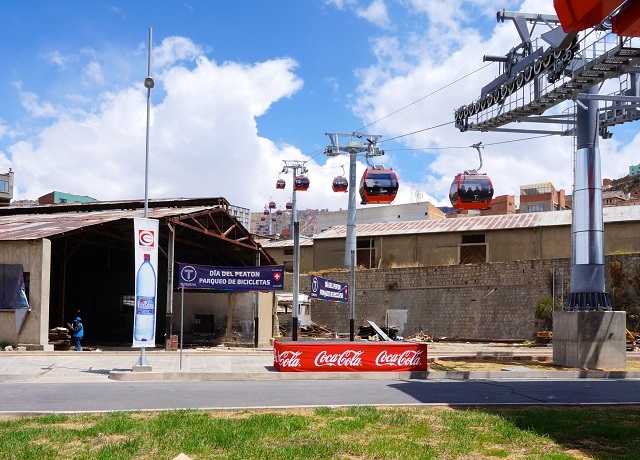 The recently opened cable car system between El Alto and La Paz, called Mi Teleférico, was operating on the Day of the Pedestrian. The city’s aging bus system, however, was stopped for the day. Some Mi Teleférico stations are still under construction, but a temporary bicycle parking station was set up at the Red Line’s Central Station. An attendant kept the bicycles safe. Photo by Gwen Kash. While Mi Teleférico will soon become the largest cable car system in the world, only one line had commenced operations before the Day of the Pedestrian. A second line began operating Monday, September 15. As a result, many paceños and alteños stayed close to home. 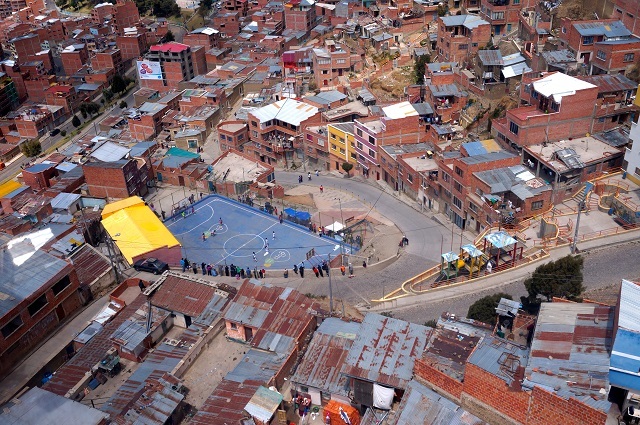 Residents of one of the neighborhoods perched on the steep mountainside at the edge of La Paz attend a nearby soccer match. Photo by Gwen Kash. 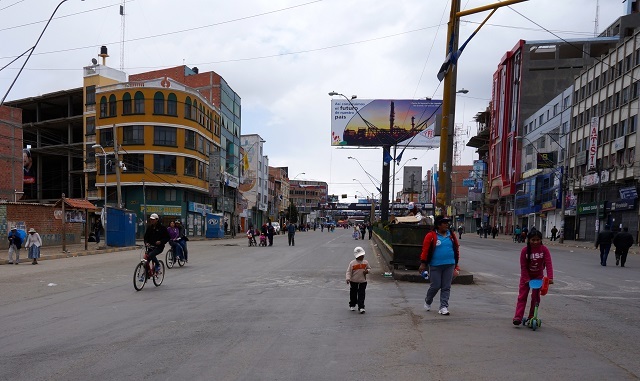 In the city of El Alto, situated on the plain above La Paz, residents strolled, cycled, skated, and scootered down the city’s main avenue. The city is less affluent than La Paz, and the municipality did not install activity stations. Residents compensated by setting up their own soccer pitches, marking goalposts with rocks, sweatshirts, or whatever was available. Residents of peripheral neighborhoods of La Paz adopted a similar strategy. Alteños of all ages enjoy the car-free main street, Av. 6 de Marzo. Photo by Gwen Kash. Because of the absence of transit, the region’s usually bustling markets were much quieter. El Alto’s Sunday market in La Ceja is typically one of the largest markets in South America, but on the Day of the Pedestrian, vendors from the countryside and city periphery could not bring their wares. As a result, most of the market’s booths were shuttered, and sidewalks normally occupied by vendors were vacant. The same was true of markets in La Paz. Without transport to carry purchases, those vendors who did come found fewer customers than usual. 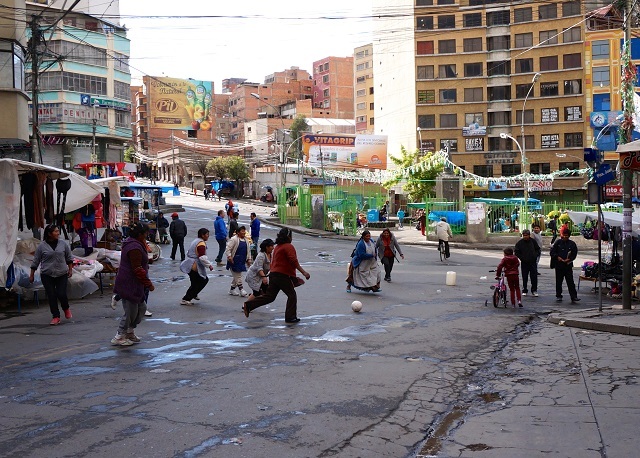 Vendors near Plaza Eguino, the heart of La Paz’s main market district, take advantage of the quiet day to play soccer. Photo by Gwen Kash. La Paz and El Alto still have significant room for improvement in creating a pedestrian- and cyclist-friendly metro area. The streets being used for soccer pitches are normally rivers of cars, many lacking adequate sidewalks. Where pedestrian crossing signals exist, there are often long waiting times. An aging vehicle fleet emits choking clouds of smoke. Ramps for disabled people are generally inadequate or absent. As one editorial put it, there are still 364 days of the non-pedestrian. Nevertheless, La Paz and El Alto are making progress. The Day of the Pedestrian and Cyclist was an occasion to celebrate. About one dozen paceños stage an impromptu miniature parade. Photo by Gwen Kash. To see more photos from the “Day of the Pedestrian” and the Mi Teleférico system, see Gwen Kash’s daily photo blog, Motion in Pictures.